These days, most weddings are planned from start to finish with a specific theme in mind. This can be anything from a fairy tale wedding to a wedding that takes place on a beach in a tropical location. Regardless of what type of theme you choose for your wedding, every single detail needs to match or the event won’t have the continuity necessary to be everything that you’ve dreamed about. Of course, this means that your wedding dress is no exception, and making sure that your dress matches your wedding theme can be more difficult than you think. The main problem is that most brides pick out their wedding dress before they choose many of the other design aspects of their wedding. This can lead to issues later on in the planning process because fitting in other details after the dress has been selected can be a very tricky prospect. Before you go out shopping for your wedding dress, there are many things that you should consider to ensure that everything flows smoothly. 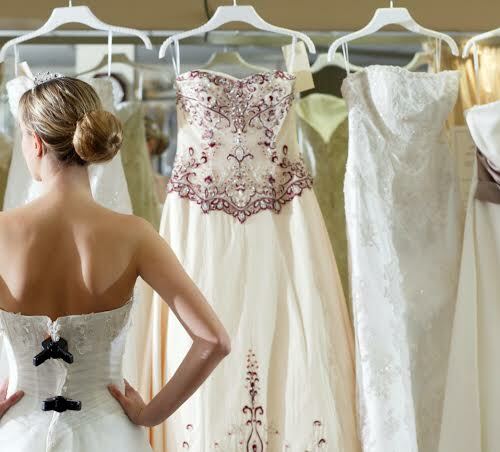 Here are some things to bear in mind before you start shopping at your favorite bridal shop. The time of year that you will be having your wedding will play a major role in your wedding theme and subsequently your wedding dress. If you are having a winter wedding, you will probably want a longer and more elegant dress. If you are having a summer wedding, a shorter dress will be appropriate so that you can stay cool. You’ll also need to consider whether you’re having your wedding indoors or outdoors. Depending on your wedding venue, the type of wedding theme you’ll choose may directly tie into that decision. Another thing to consider before you choose your wedding dress is the type of decorations and wedding favors that you’ll be having at your reception. The most important thing to focus on here is your color scheme because you don’t want your wedding dress to clash with the colors you select for your decorations. If you want a lot of pink and red decorations, for instance, you’re dress will need to compliment that color scheme. Also, if you are having flammable wedding favors such as sparklers then you’ll want to keep your dress short enough so it doesn’t drag on the ground. The falling sparks from the burning sparklers can cause small burn hole in your dress which can thwart your attempts to preserve it after the wedding is over. Your choice in flowers should also be carefully considered before you go out shopping for your wedding dress. For your bridal bouquet, if you want to have a lot of rich colors like yellow, blue, and purple, you’ll want a dress that is a little more complex than just plain white. On the other hand, if you are choosing a single color such as red, pink, or white flowers, then a solid white dress will blend into your theme nicely. Additionally, the flowers you use for your centerpieces and other areas around the reception hall need to match your theme in the same way, so make sure you plan out all of your color choices well in advance of choosing a wedding dress design. Though it isn’t exactly an aesthetic issue, ensuring that your wedding dress is comfortable will also need to be considered before you make your selection. Weddings tend to be very long, and then you’ll need to consider the activities that will take place at the reception. If you plan to do a lot of dancing, you’ll want to choose a dress that is flexible and comfortable. You’ll also want to have some comfortable shoes so you don’t get achy feet in addition to them matching the rest of your wedding theme. Many brides choose to bring along another pair of shoes for after the ceremony that will be much more comfortable, so that’s something you should keep in mind when you go out shopping.